If you’re like me, you’re always looking for new ways to improve your website’s performance, increase your conversion rates, and add new subscribers to your email list. Beyond the manual improvements and enhancements, there are tools that can help you on this matter. One of those tools is OptinMonster and now you wonder if it’s worth your investment. You’re in the right place, I will carefully analyze all the OptinMonster’s website departments, the product’s features, its price, I will gather statistics from other online reviews, and I will give you my final opinion at the end of this page. Additionally, I will explain if it’s worth your investment and what you need to do to experience great results with this tool. Main Slogans: Convert and Monetize Your Website Traffic. Instantly boost leads and grow revenue with the most powerful conversion optimization toolkit in the world. 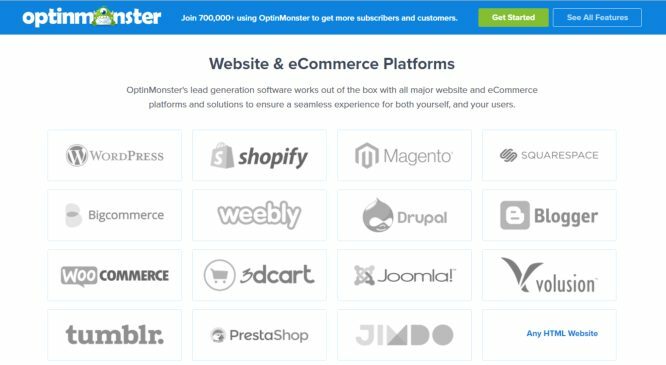 700,000+ websites are using OptinMonster to turn their traffic into leads, conversions and sales. And most websites capture less than 1 email for every 200 visitors. That’s a lot of time, money and effort going to waste. 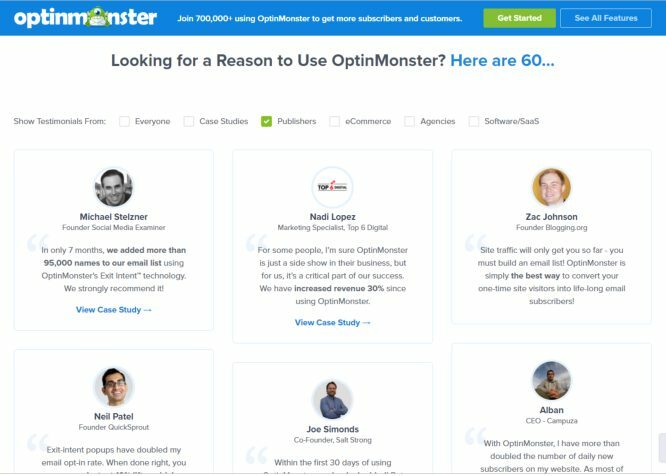 The Story: The team behind OptinMonster was looking for ways to capture email addresses and increase website conversions. But they had a hard time with the available tools in the market that were either difficult to use or very expensive. They started using their new technology on their site and after numerous requests from users and industry experts, they decided to package the product as OptinMonster back in 2013. Since then, thousands of websites boost their conversions with this tool, from small businesses to Fortune 500 companies. Over a billion people see a website with OptinMonster on it every month. Who is it for? marketing agencies, blogs, eCommerce sites, online stores, all kind of small businesses. Thomas Griffin: co-founder and President of OptinMonster. Prior to OptinMonster, he founded Soliloquy, the fastest WordPress slider plugin, and Envira Gallery, a revolutionary gallery solution for photographers. He is an expert developer with deep knowledge of building simple products for the mass-market. Syed Balkhi: co-founder and strategic advisor of OptinMonster. Prior to OptinMonster, he founded WPBeginner, one of the largest free WordPress resource sites. In 2011, Syed started List25, a widely popular entertainment site with over 1.5 million subscribers and quarter billion video views. The OptinMonster team ensures that their tool uses the traffic you already have in order to generate leads, conversions, and sales. And all it takes is 3 simple steps. Create a visually stunning offer choosing from a wide variety of pre-built templates or be creative and design your unique offer with a black canvas. The customization is easy with the drag and drop builder, no need for coding whatsoever. 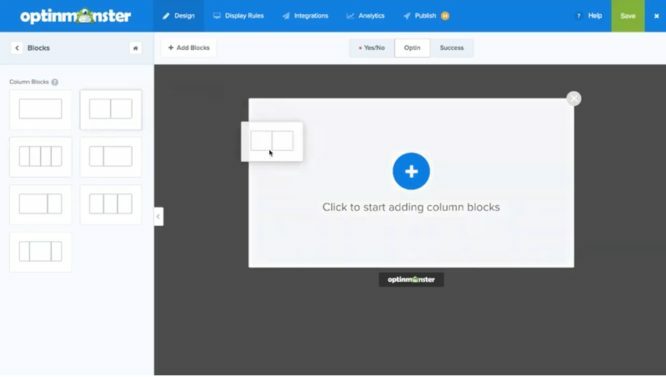 You can add or remove elements & columns, style everything, fine-tune every detail, add your unique content, add your own images, include a countdown timer, collect subscriber info. Target and personalize your offers with behavior automation. This is one of the most powerful features as it lets you show a selected offer to the right people at the exact right time. 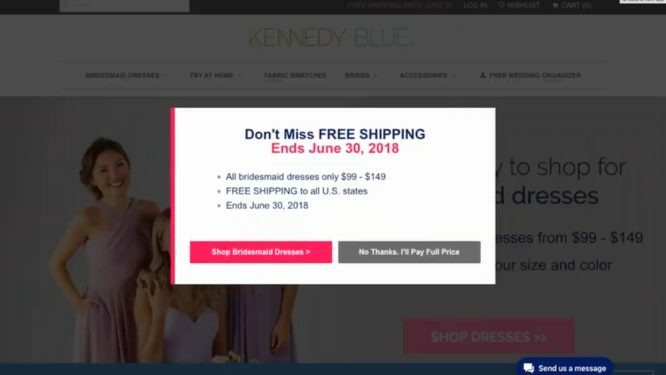 You can personalize your message, optimize for engagement, trigger specific actions based on unique visitor’s behavior, add coupon codes, special deals, and more. Test and adjust in real-time. The plugin gives you statistics you can use to improve your strategies and campaigns. You can run split tests on different ideas/campaigns to increase your conversions. There are campaign specific analytics, results with data, and you can discover promotional opportunities. Lead-capture forms: 75+ pre-made templates fully customizable. Multiple form types: pop-ups, floating bars, fullscreen overlays, slide-ins, and more. A/B testing: test different headlines, content, and layouts to see what converts better. Exit Intent Technology: personalize your campaigns based on your visitor’s behavior to maximize conversions and sales. Page level targeting: hyper segment your leads by using an enetrprise-grade page level targeting and segmentatino rules. Advanced traffic redirection: send traffic to iumportant pages on your site. Add a button, customize the action, and track engagement. Analytics and insights: Get statistics, compare split tests, and learn which pages convert better. Drag ‘n drop builder: allows you to create attractive campaigns that are optimized to deliver the highest conversion rates. In fact, it’s the easiest way to generate leads from your business website. You can customize the message, colors, images, fonts, and everything else to create a layout that matches the look and feel of your website. You can also add elements including images, dividers, buttons, videos, countdown timers, and more to any campaign. Yes/No forms: Often people are worried that giving visitors two options may reduce conversion, but OptinMonster’s data shows otherwise. As explained by the psychology principle, Zeigarnik Effect, people who begin an action are more likely to complete it which means that visitors who click the Yes button are more likely to opt in. People are also more likely to opt in if they feel they have a choice. Mobile friendly pop-ups: OptinMonster can help you get the attention of smartphone and tablet users with its Mobile-Friendly Popups, specially designed to perform well on all mobile devices. Custom success message: personalize your thank-you page or opt-in confirmation message to deliver a targeted message that encourages new leads to further connect with you through your content, social media, and by making additional purchases. 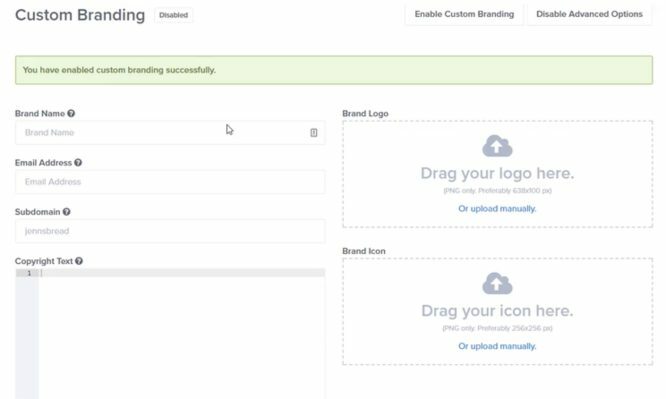 Canvas: Canvas lets you start with a blank slate and customize your campaigns from scratch using the drag & drop builder. Monster Effects: When you create highly visible campaigns, you solve the problem of design blindness which results in higher conversions. The signature MonsterEffects™ technology provides CSS animations and sound effects to create campaigns that grab user’s attention and focus. You can choose from 26 CSS effects! They’ve also added a Sounds Effect feature to help you create even more attention-grabbing campaigns. This feature complements the InactivitySensor, also known as Mobile Exit-Intent. Lightbox Popups: deliver a targeted message at just the right time for maximum engagement. Lightbox popups are proven to work for email lead capture as well as increasing sales conversion. When you show a lightbox popup, visitors have to make a decision. There are no distractions because your other content fades into the background. Fullscreen welcome Mat: helps you get visitors’ attention the minute they land on your site with a website splash screen that’s proven to increase conversions by as much as 80%. There’s no better way to grab visitors’ attention than with a targeted call to action before they have a chance to get distracted and leave. OptinMonster’s Fullscreen Welcome Mat will help visitors remember and connect with your brand. Slide-in scroll box forms: Slide-ins appear at the bottom right corner of the web page as the visitors scroll down. They work well with the Scroll Trigger, which lets you specify how far down the page visitors get before they see your scroll box. Floating header and footer bar: is a sticky and highly noticeable campaign that attaches to the top or bottom of the web page and remains visible as your visitors scroll. It’s a great way to get visitors’ attention without disturbing or annoying them. Like all OptinMonster campaigns, Floating Bar benefits from OptinMonster’s extensive and flexible range of triggers and targeting rules. You can change campaign behavior by using Timed Display Control to affect when it appears. You can also control visibility with Page-Level Targeting, Geo-Location Targeting, Device-Based Targeting, Referrer Detection, and Scroll Trigger. And OptinMonster has rich behavioral automation rules such as Onsite Followup, Onsite Retargeting, and Cookie Retargeting, which give you even more control over who sees your campaign. Countdown timer: create intelligent, scarcity-based campaigns that effectively convert hesitant buyers. Sidebar forms: Sidebar Forms are one of the most common ways to build an email list, and the sidebar is where many web visitors look for newsletter signup information. Gives you the chance to convert visitors from anywhere on your site, turning each page into a lead generation opportunity. The more places you have a campaign, the more opportunities there are for someone to subscribe, or take your offer. Inline forms: help you get the attention of your most engaged readers, and encourage them to subscribe when they’re already committed to reading your content. That’s why Inline campaigns are so effective for subscriber growth, especially on content-heavy sites. Content locker: lets you block part of your content and make it available to subscribers only, encouraging more email signups and attracting high-quality leads. The lock will blur or remove content below a set point on the page, so visitors have to opt-in to see the whole article. Coupon wheel optins: Gamification is a psychological trick that smart marketers use to instantly multiply their conversions. When you unlock a prize or earn a high score, your brain rewards you with a rush of dopamine, a hormone that makes you feel great. You can trigger this response by adding interactive, engaging elements to your marketing campaigns, making them so fun they’re addicting. Exit-Intent Technology: is behavioral technology that tracks and monitors movements of website visitors and detects when they’re going to leave your site without making a purchase or leaving their information. It is designed to reduce cart abandonment and capture more leads. OptinMonster promises that by using this SMART behavioral technology, you can convert an additional 2 – 4% of your users into email subscribers and soon thereafter into paying customers. 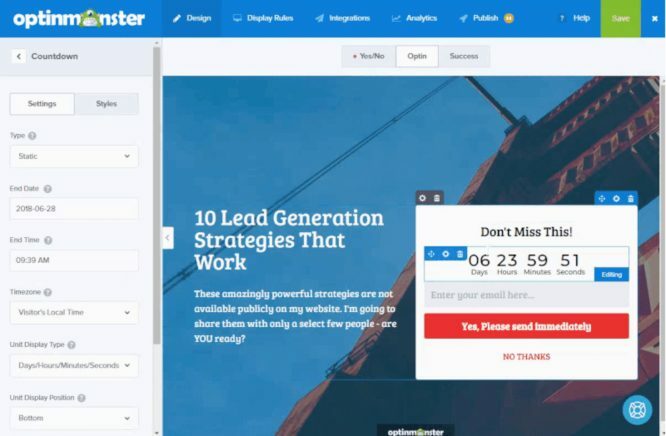 Scroll Trigger: OptinMonster’s Scroll Trigger helps you get visitors’ attention without being pushy, so you can boost conversions and generate more leads. It creates scroll triggered boxes for strategic placement on your website. Scroll triggers can be used as pop-up, fullscreen, slide-in, or floating bar campaigns. MonsterLinks 2-step optins: MonsterLinks turns any image or link into a 2-step optin campaign, with no coding required. When visitors click on the image or link, there’s a popup asking them to subscribe or buy. InactivitySensor (exit intent for mobile): allows you to activate Exit Intent for mobile devices to help you convert those abandoning visitors into subscribers and customers. InactivitySensor detects users’ behavior so you can deliver a targeted campaign to mobile users the moment they’re about to leave your website. It works on every device, so you can recover some of that lost revenue, no matter how your users are browsing. Timed display control: you can set time delays for your campaigns to avoid inconveniencing visitors while still gaining subscribers and making sales. The time-triggered popup campaigns allow you to focus your visitors’ attention at the perfect moment: after they have time to browse your site, but before they lose interest and leave. Campaign scheduling: detects users’ time zones so you can show holiday promotions and other time-sensitive campaigns to them at the right time. Referrer detection: This tool detects when visitors have followed one of your external marketing campaigns to land on your website, so you can create a new campaign targeted specifically to those visitors. Page-level targeting: lets you use behavior personalization to create page-specific campaigns. You can easily segment your email list and group subscribers based on their interests and interaction with your website. OnSite follow-up campaigns: help you get the attention of wavering visitors with triggered campaigns. OnSite retargeting: If you’re showing returning visitors the same campaigns they saw the first time they landed on your site, you’re turning them off, especially if they’ve already subscribed. Retargeting® lets you target repeat visitors with new promotions and offers based on their previous interactions on your site. eCommerce retailers and publishers can use onsite behavioral data to target marketing campaigns to boost conversions. Geo-location targeting: helps eCommerce retailers and content publishers show relevant campaigns based on users’ locations. Cookie retargeting: you can hack your retargeting strategy and save money by creating your own onsite audience. This technology takes the features in our OnSite Retargeting to the next level. It allows eCommerce retailers and small businesses to fine-tune content personalization and increase leads and sales without wasting money. Device-based targeting: allows you to format campaigns for phones, tablets, and desktops, so you can create a better user experience and improve your conversion rates. AdBlock detection: helps you bypass AdBlock, AdBlock Plus, and other ad blockers, and recover the income that’s going down the drain. List segmentation: allows you to reduce abandonment and list churn by providing relevant and personalized experiences for your visitors and email subscribers. Integrates with industry-leading CRM and email marketing software so you can personalize and optimize all your campaigns to get the best results. Lead sharing: lets you manage leads more efficiently by sending them to as many different lead management services as you need. It makes it easy to improve internal lead management or share leads with joint venture partners. Allows you to configure your campaigns to pass leads to multiple providers. 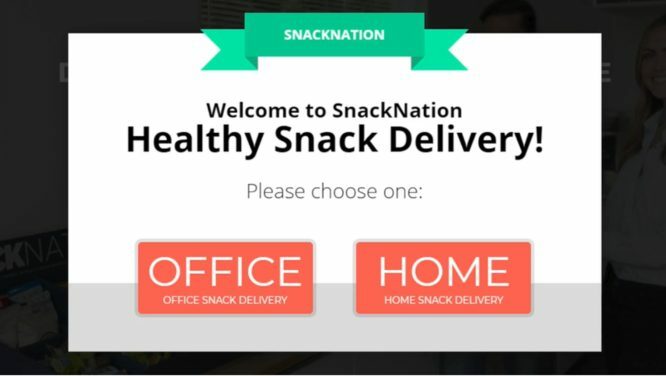 So if your sales team is using Infusionsoft to manage customers, and your marketing team is using MailChimp for your email newsletter, both teams can benefit from the lead generation strategies used on your website. Saves you time and effort by capturing leads from a shared landing page, and sending that information to each partner’s email marketing or lead management software. It’s automatic, instant, and there’s no limit to the number of leads you can share. Success tracking and retargeting scripts: remind visitors about your products and services, long after they’ve left your site. 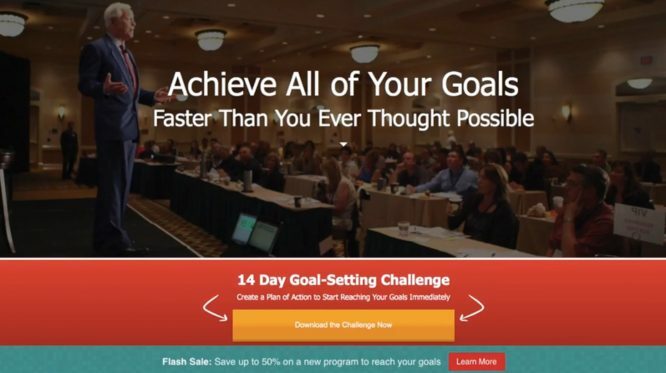 Our success scripts let you retarget warm leads to improve conversions, leads and sales. Retarget warm leads: people who have already visited their site and subscribed to their email newsletter or downloaded a lead magnet. Serve a Facebook ad pixel or AdWords pixel when users subscribe. 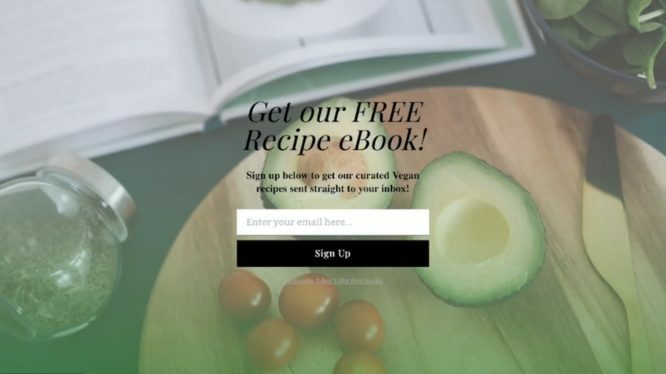 You don’t even have to create a thank-you page, saving time and effort. Smart Tags: Personalization is the best way to ensure your offers are always relevant. Allows you to place dynamic content in your onsite marketing campaigns with the click of a mouse. If you’ve ever used merge tags in email, then you’re already familiar with just how easy and useful Smart Tags can be. Real-time behavior automation: helps you show relevant campaigns which instantly adapt to visitors’ current behavior on your site. Two-thirds of consumers prefer to receive only relevant offers, and many of them will abandon sites that don’t meet their needs. A/B testing: lets you split test your campaigns so you know what’s working for your customers. With the click of a button, you can create a split test and try different content, headlines, layouts, styles, and campaign triggers to see what converts best. Smart success: helps you avoid annoying your visitors by providing smart subscriber recognition – a way to recognize people who have already signed up so you can offer them something new. Encourage people to follow you on social media by embedding a Facebook Like Box in one of OptinMonster’s specially designed themes. And you can use the Theatre theme to play a video that keeps visitors on your site and fully engaged. Conversion analytics: makes it easy to get the stats that matter so you can improve lead generation. It integrates with Google Analytics to allow you to track and measure conversion goals and the success of your optin campaigns. With Conversion Analytics, you can analyze clicks, views and overall conversion rate for each of your optin campaigns. If you’re using OptinMonster’s A/B Testing feature, you can also get that data for all of your split tests. Conversion Analytics tracks the referral pages for each optin, allowing you to see which pages on your site are driving the most conversions. And you can also see user-agent data, so you’ll be able to optimize your lead generation campaigns for specific devices or web browsers. Sub-accounts: let you share access to your OptinMonster account with the people you work with, so you don’t have to manage every campaign yourself. As account administrator, you can allocate user roles to decide who else can view, create or publish campaigns, and apply these user permissions to domains, campaigns and integrations in your OptinMonster account. Custom branding: you can add value to your current client offerings and help them to get a higher return on their marketing investment…while you take all the credit. 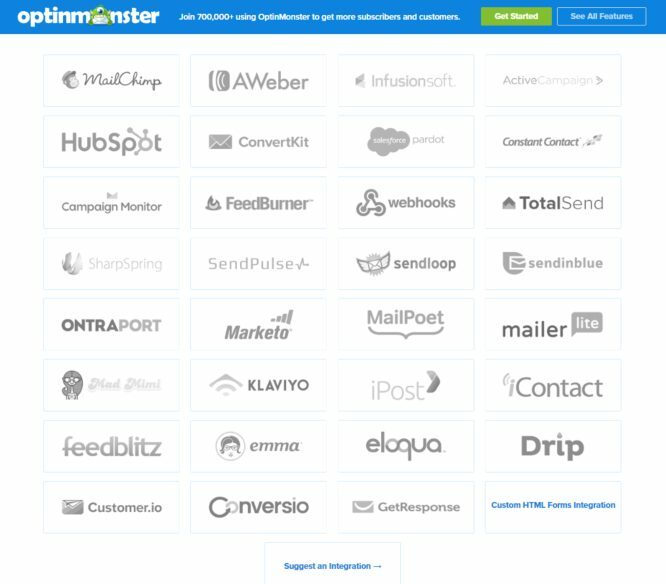 OptinMonster’s lead generation software works out of the box with all major email marketing platforms and with all major website and eCommerce platforms and solutions to ensure a seamless experience for both yourself, and your users. Documentation, Reference Materials, and Tutorials for OptinMonster. The university provides digital marketing training to explode your business growth. 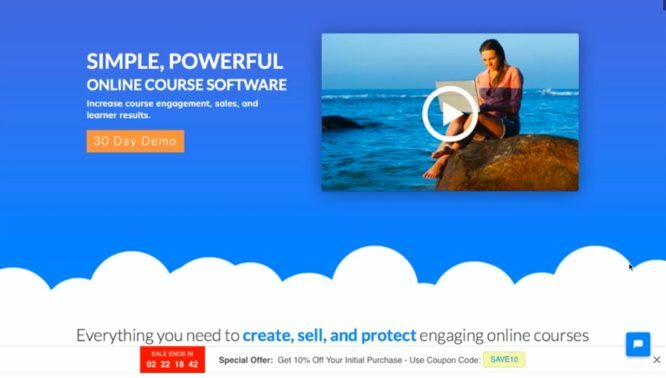 It’s the place where entrepreneurs, business owners, and marketing professionals learn how to attract and convert website traffic into customers. University Access Price: $197 one-time payment. The blog is pretty active with over 400 articles. It’s about WordPress, marketing, lead generation, plugins, eCommerce. There are case studies, announcements, and tutorials. There are valuable lists and extensive guides. A very useful department that shows the integrity of this company. OptinMonster is one of the most popular solutions of lead generation software in the market. It’s being used and praised by thousands of marketers, entrepreneurs, bloggers, and there are many friends of mine that highly recommend it. Among the testimonials, you’ll find top industry leaders and founders of well-known businesses. I only came across a few bad ratings about customer support but nothing very serious. *More on that in my conclusion! Smart Business Trends – OptinMonster is definitely worth looking at as it has several features that make building your list easier. 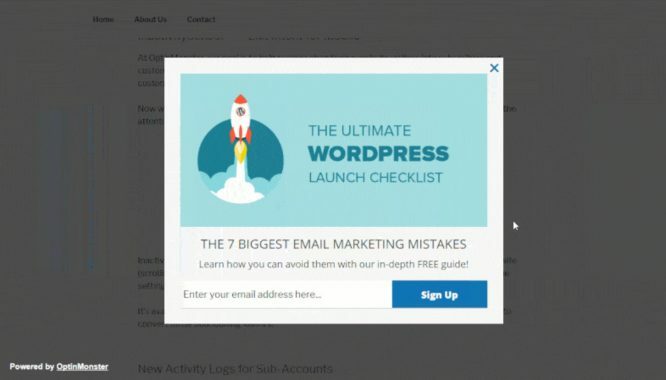 WP Site Care – The exit intent functionality is the key selling point of this service, which makes it a not in-expensive option if you want the full feature set. There are a plethora of case studies that show exactly what this tool can do for any business. The “Careers” page contains guidelines and describes the benefits of working with them, the requirements, and the company’s core values. Currently there are no available spots.